As the 8-month West African Ebola outbreak death tally accelerated beyond 4 500 (of 9 000 people infected) by mid-October, Spain and the USA became the first non-African countries to record secondary domestic infections after entry by Ebola-infected people. In the original West African outbreak countries of Liberia, Guinea and Sierra Leone the number of cases is doubling every 3 weeks, overwhelming thinly equipped facilities, with rotting bodies lying in the streets and countryside. By mid-October, some 6 000 frontline healthcare workers were infected and 240 had died, eliciting loud protests from the World Medical Association (WMA), holding its annual meeting in Durban. The US Centers for Disease Control (CDC) estimates that unless better controlled, Ebola could affect up to 1.4 million people by January. By mid-October, some 6 000 healthcare workers were infected and 240 had died, eliciting loud protests from the World Medical Association (WMA), holding its annual meeting in Durban. The international rescue and relief effort began to quicken only after the handful of Ebola infections had crossed European and North American borders, causing secondary infections on both continents. Back in West Africa the vanguard of the treatment and contatinment effort, Médecins Sans Frontières, were paying a deadly price for their 'against-all-odds' battle, losing nine healthcare workers, with 16 infected among their 3 000 staff in the region. On 9 October, the USA boosted its response by dispatching six military cargo planes carrying 100 soldiers from its 101 Airborne Division to join the 250 already in Liberia and Senegal, together with equipment and medical staff to set up and run 17 treatment centres and seven mobile laboratories. It also put 3 900 more soldiers on standby to join them, but army commanders initially said this would probably not be necessary. The soldiers will not treat but help set up facilities, distribute equipment and contribute logistical support. In the USA, wall-to-wall cable network TV coverage ran unabated, focusing almost entirely on the domestic Ebola 'incursion'. One of the US Ebola-infected duo, Liberian Thomas Eric Duncan, visiting family in Dallas-Fort Worth, Texas, arrived in the USA displaying no symptoms and was sent home from a clinic visit bearing only antibiotics, to return days later in a severely weakened condition, dying within weeks. The correct initial history taking (but failure to respond appropriately to his listed country of origin) and diagnosis put North Dallas hospital and public health authorities onto high alert, eliciting initial threats of prosecution from Liberia and the USA for his not having declared contact with Ebola victims before boarding his US-bound flight. Two Dallas nurses who helped treat him, Nina Pham, 26, and Amber Vinson, 29, became infected a fortnight apart and were in a 'clinically stable' condition, Pham after receiving a blood plasma transfusion from Dr Kent Brantly, a Texan who survived the virus. CDC officials said a 'breach of [treatment] protocol' was responsible for Pham contracting the disease, launching an urgent probe into how Vinson was allowed to board a plane from Dallas to Cleveland for the weekend - after reporting her slightly elevated temperature to the CDC. The plane was hangared, disinfected and returned to service, its crew put on paid leave. In spite of Vinson having flown while 'asymptomatic', all passengers on her return flight to Dallas were asked to call the CDC for follow-up interviews. Containment measures and vigilance on the 78 healthcare workers who treated Duncan were urgently stepped up. Duncan had reportedly taken his landlord's 19-year-old pregnant daughter to an Ebola treatment unit in Liberia's capital, Monrovia, where she was turned away because of insufficient space. Duncan brought her home, where she died hours later. Four of his immediate relatives were under quarantine in their Fort Worth home with temperatures taken twice daily over the 21-day incubation period, while up to 50 other Americans he came into brief contact with were also being 'closely monitored' for signs of the disease. President Barack Obama resisted loud calls to impose a ban on incoming passengers from the three most affected countries, instead ordering the CDC to expand precautions at relevant airports and to use US point-of-origin filters and thermal screening. The initial lack of urgency shown by much of the international community was worsened by relatively recent budget cuts at the World Health Organization (WHO). After the 2009 global financial crisis, the WHO's budget dropped by roughly $1 billion, nearly 25% of its budget today. By March this year, when the current Ebola outbreak began, staff levels at the WHO had been cut by 35%, further hampering the organisation's ability to prepare for and respond to health emergencies and prompting drastic cuts to its infectious diseases budget, now considered absurdly inadequate. The other two newer Ebola victims on 'foreign' soil were Teresa Romero Ramos, a nursing assistant in Madrid who cared for one of two Ebola-infected missionary priests flown from Sierra Leone to Spain in September (both priests subsequently died, and she was reportedly 'serious but stable'), and Ashoka Mukpo, an American freelance cameraman who checked into a Nebraska hospital in Omaha, suspecting he had been infected either while spray-washing a vehicle in Liberia in which an Ebola victim died, or while filming in an Ebola clinic (reportedly 'improving'). All human contacts of both victims were being isolated and monitored, with no initial signs of the disease. An Ebola-infected British male nurse, Will Pooley, discharged from the Royal Free Hospital in London in early September, was granted an emergency passport to fly to the USA, where he also donated blood in an initial attempt to help treat the two victims there. A predictable animal-rights debate erupted when the Madrid health authorities obtained a court order to kill the Spanish nurse's dog instead of quarantining it. The 15-country South African Development Community (SADC) 'home front' - with the exception of the Democratic Republic of Congo (DRC) - remained clear of any Ebola intrusions. The DRC outbreak is of a strain unrelated to the West African pandemic, with relatively small numbers (70 cases and 42 deaths as of 28 September 2014), but strongly underscores the need for rapidly accelerated surveillance and control preparedness measures in sub-Saharan Africa. The outbreaks in Nigeria (20 cases, eight deaths) and Senegal (one survivor), swiftly controlled, are believed to be 'over,' with no further recorded infections. Meanwhile, the National Institute for Communicable Diseases (NICD) in Sandringham, Johannesburg, conducted its first 2-day 'hands-on' Ebola training session for SADC member states on 23 and 24 September, with at least three people from every member country attending. This followed an earlier SADC health ministers' Ebola 'Indaba' in Gauteng, where co-operation, training, funding and equipment procurement topped the agenda. The NICD workshop delegates ranged from physicians, laboratory directors and specimen couriers to public health and port control officials. Speaking from the SADC's headquarters in Gaborone, Botswana, Mr Joseph Mthethwa, SADC Programme Director: Health and Pharmaceuticals, said that emphasis was being laid on port health, adherence to international infection control standards, identifying responsible public health officials, disease containment, specimen-taking and couriering procedures, integrated disease surveillance and response, and clinical care. 'We'll have to come up with a combined strategy, financial model and procurement plan that will stand in for everybody,' he said. An initial 'train the trainer' healthcare and prevention strategy was being put into place, while a secure internet portal had been set up for senior government health officials and ministers. He said that the SADC ministers of health had met twice on Ebola, and were due to meet again in late October. 'We also have to rely on what's happening at the WHO - not just at our level,' he opined. The NICD training programme was 'all about the practicality of managing this problem, evolving the roles and responsibilities of medical health services, and what the role of the military should be (raising public awareness, crowd control, containment measures)', he added. Most speakers were South African (SA) experts, but included several from the renowned Pasteur Institute in Madagascar. Local Director-General of Health, Ms Precious Matsoso, opened the programme. National Minister of Health Dr Aaron Motsoaledi meanwhile pulled together a multidisciplinary Ebola advisory team of SA's top scientists to support the SADC region, announcing a R32.5 million Ebola 'preparedness and response' budget. Together with the private sector, he also set up an almost certainly larger West African Ebola rescue fund to secure and airlift into the most affected West African regions critically needed medical equipment, including thousands of personal protection suits, mobile crematoria, some ambulances and 12 scooters. Speaking at the launch of these efforts on 10 October, he described the local West African rescue effort as 'helping shut off a global problem at source - better we all go to West Africa than deal with it at home'. He added that Ebola outbreak response teams had now been set up in every province in SA. 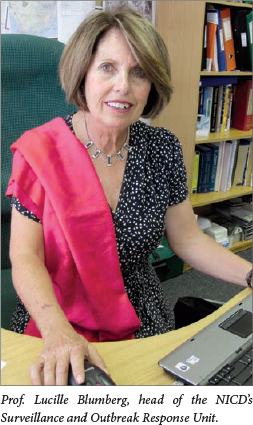 Dr Lucille Blumberg, head of the NICD's Surveillance and Outbreak Response Unit, said that, contrary to claims in the October Izindaba Ebola report that SA had 'no outbreak laurels to rest on', several viral haemorrhagic fever (VHF) cases or 'outbreaks' had been successfully contained over the past decade and a half. The Izindaba report was based on opinions expressed by former CDC staffer and now local disease surveillance expert Dr Andrew Medina-Marino on his return from helping out in Liberia. He posited the theory that SA's history with HIV (pre antiretroviral drugs) and extensively drug-resistant tuberculosis (XDR TB) (also no proven drugs available) boded ill for any scattered West African-type local urban Ebola outbreak. While disagreeing with the comparisons, Blumberg conceded that a scattered urban Ebola outbreak here would pose considerable problems. However, she stressed that 'so far we've contained every outbreak at source and we hope to continue doing so'. There had not been a single secondary case of Crimean Congo fever (endemic here), of which between zero and ten local cases were recorded annually over 'the last decade or so'. Her unit had also identified and named the novel 'Lujo' (Lusaka/Johannesburg) virus that caused the deaths of five people, four of them with Johannesburg hospital-acquired infections, in 2008 (for further local VHF containment history, see the editorial1 in this issue). Blumberg said that the NICD had the capacity for rapid, reliable and specialised differential diagnoses of VHFs, including Ebola, which was integral to the response to any suspected case(s) that might present to SA healthcare facilities. The NICD had tested 'less than a dozen' local blood samples for Ebola (all negative) since the West African outbreak, mainly because 'very strong filters' were in place, including travel history and potential exposure. 'Having said that, people don't have to beg us for a test,' she emphasised. The contention of Medina-Marino and SA's leading expert on drug-resistant TB, Prof. Keertan Dheda, that alarm bells should be ringing more loudly around XDR TB than Ebola was 'very well made - the question that should be asked is why isn't this kind of effort going into XDR TB? ', Blumberg said. However, using these diseases as evidence that SA would struggle with an Ebola outbreak was 'just wrong … we're talking about an endemic chronic disease versus an acute outbreak', she added. Medina-Marino, reported as saying that the NICD was mainly funded by the US government, has explained to Izindaba that he was referring to the NICD's Field Epidemiology and Laboratory Training Programme being predominantly funded by US PEPFAR and the Global Disease Detection Program for the past 7 years. 'The SA health department needs to take ownership of this funding in order to make it sustainable. It's meant to increase the country's capacity for outbreak investigations - the current Ebola outbreak simply highlights this,' he said. Medina-Marino addressed the WMA's annual assembly in Durban in mid-October on his recent Liberian experiences. The WMA (40 national medical associations) passed an emergency resolution urging governments to do 'far more' to fight the viral disease. It said that evidence from those treating patients in affected communities was that a shortage of healthcare workers, personal protective equipment and beds, plus poor ability to initiate control measures, was bedeviling efforts. It called on the United Nations and its agencies to provide these immediately, emphasising that healthcare workers needed adequate supplies of gloves, masks and gowns. These should be urgently dispatched to every functional treatment centre to prevent the cross-infections of healthcare workers that were currently crippling an effective treatment response. Meanwhile, the ethical and human rights dimen sion of the outbreak has moved centre stage. Prof. Frans Viljoen, Director of the Centre for Human Rights at the University of Pretoria, says that HIV has taught South Afri cans that coercion and compulsion is not the way to go, driving patients underground and exposing the population to greater risk. Instead, education, raising of awareness and making clinics open and desirable, places where you go to be healed, not to die were crucial to an effective response to Ebola. Viljoen says that a balance needs to be struck, instead of seeing Ebola victims solely as vectors or victims: If you over-emphasise the communitys interests in curbing the disease, you can miss taking the victim seriously. We have a duty of care a totalitarian approach can never work. He says that healthcare workers cannot be forced to treat Ebola patients, using the metaphor of a lifeguard declining to rescue a blood-soaked swimmer floundering one kilometre out to sea in the midst of a pack of hungry sharks. However, if the swimmer is half that distance away in a very strong sea, you still have to go. He said that clearly not all health care workers could be issued with infection-hazard suits. Reasonable, commonsense precautions should prevail around asymptomatic patients, with risk-benefit analysis taking priority. You have to ask to what extent you can uphold the Hippocratic Oath while at the same time considering the risks, he said, adding that its all contextual; it depends on what equipment you have. There will be optimal conditions and other contexts where you and other healthcare workers are at great risk. He took issue with President Obama typifying Ebola as a global security threat, saying that it had been around since 1976 and that malaria had killed 300 000 Africans over the time of the latest Ebola outbreak. He said Ebola was being othered by the global developed world  and by African leaders. At first it was restricted to rural areas, now its urban and suddenly theyre taking notice  woken up. Lagos (Nigeria) is a perfect example. The political elite couldnt have bothered initially. The positive is that we can hopefully now prioritise these neglected diseases. Putting a travel ban on all Nigerians, for example, was just one step away from stigmatisation.